The S series of Samsung is Top flagship series of the company, and in general it sets a benchmark for other counterpart device. 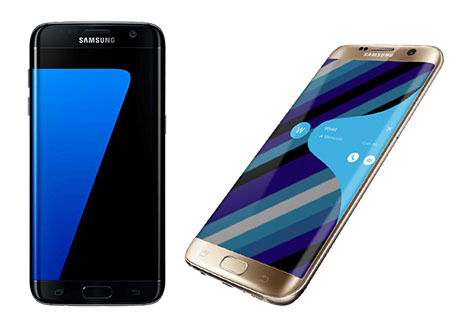 As we already discussed about the Samsung Galaxy S7 which is bit smaller in size without curved edges. However both the device shares same kind of software and hardware configuration. Curved edge is uniqueness of the Samsung Galaxy S7 Edge. This handset has very astounding specs like v6.0 (Marshmallow) OS, Snapdragon 820/ Exynos 8890 Octa processor, 5.5 inches Super AMOLED display, 12MP rear and 5 MP front camera, 32/64 ROM with 256GB SD card support, 4 GB RAM and 3600 mAh battery. Materials used in crafting the phone made up of using a proprietary process called 3D Thermoforming, in which melded 3D glass to curve with such precision that it meets the curved metal alloy to create an exquisitely seamless and strong uni-body. The curved device and bigger size of phone can be somewhat tough to handle with a single hand. Although it looks luxurious while keeping in hand or table. Samsung Anew returned the Water and Dust resistance feature with the IP (Ingress Protection) rating of 68. (Handset Can be immersed in 1.5 meter of water for up to 30 minutes). A physical home button with integrated fingerprint sensor is just below the screen, power button on the right, and volume rockers on the left. Phone has standard Micro-USB port, 3.5mm audio socket left and a small speaker grille on the bottom. However a hybrid SIM slot and Card slot is located on the top. The experience of watching movies in S7 Edge is amusing; display is vibrant and emits sharp and balance colour. All credit for such a striking 5.5 inches Super AMOLED display goes to 1440 x 2560 pixels resolutions with 534ppi display density. The colour reproduction is sharp enough that makes phone easily operated in sunlight condition. There is no constraint about the display, visibility is pleasurable. When it comes to the performance of Smartphone which is completely depending on the CPU of device, on the basis of CPU there are two variants of Galaxy S7 Edge. One is loaded with Snapdragon 820, but in India they have launched the device with their own chipset Exynos 8890 Octa; which is nearly equivalent to Snapdragon 820. The powerful Exynos 8890 is definitely taking the phone performance to another level as all the apps are running smoothly and playing Graphic intensive heavy game on the device is fun, although phone warm up while playing heavy games for long time but it is under acceptable range. Phone also has Game tools where you have access to some pretty cool functions such as Screenshot, No alert during Game. Among them, gameplay recording are some of them; that only make your gaming experience better than ever. Some people are complaining that Samsung reduces the camera from 16MP to 12MP when comparing it with its predecessor device Samsung Galaxy S6; Along with this it should be also noted that 16 MP Galaxy S6 camera is equipped with f/1.9 aperture however Galaxy S7 Edge is equipped with larger f/1.7 aperture which enables entry of more light in camera sensor; so we can take better photos even in low light conditions. The camera department of phone is surprisingly superb which can also take 4K videos. To access the camera there is shortcut; you can double tap the display anytime which will open default camera app. There is pre-installed 3600 mAh battery, enough to give full day battery even after moderately heavy use. We also found that because of some unknown reason Samsung ignored quick charge 3.0/ USB Type-C charging and embraced Standard USB cable. IP 68 rating Water and Dust resistance. Having sensors like Fingerprint, accelerometer, gyro, proximity, compass, barometer, heart rate and SpO2. Difficult to handle with single for some people. If you looking for one of the most premium handset with very versatile features and an unique luxurious look then S7 Edge is one of the best choice. The phone has enough to show quantitatively and qualitatively. The handset look is gorgeous, Night photos are crisper than expectation, performance even in heavy gaming is smooth and battery will not ditch you before full day; till you don’t use it very intensively. There are two ROM variants 32 GB and 64 GB; choose what suits you however you can also expend memory up to 256 GB. If you have complaint about large size and don’t want pay extra for curved edges; you can choose the Galaxy S7 with same configuration.